While not everyone needs a dietary supplement, they can be of great value if you are lacking nutrients in your diet. As vegetarians, I am specifically talking about B12, calcium, iron, and vitamin D.
YES. I know, you can find these products in whole foods (except for B12) and don’t need to rely on supplements, but does your diet stack up? Personally, while I think I have a pretty good intake, I do take B12 and occasional calcium, D, and Omega-3. For me, supplements are just that- meant to supplement healthy eating, not substitutes for a healthy diet. We still can’t eat mac and cheese all day, pop a multi and call it a day. If you are one for taking supplements, do you know the source & purity? A lot of commercial supplements are junk, a sea of drugstore choices that can be pretty confusing if you’re not sure what you are looking for. Whenever I evaluate nutrient supplements, I scan the product to see where it’s derived from. First off, is it a vegetarian source? Next up- does it contain the word oxide? Typically, the oxide form of any supplement is the cheapest source & poorly absorbed… Skip it! There are some great supplement companies out there: Designs for Health, Thorne, Body Bio, & of course Arbonne to name a few. I was recently introduced to Arbonne and highly recommend both their skin care & wellness products. My favorite part? Their commitment to purity. 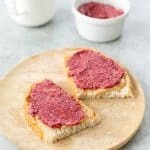 All products are vegan, not tested on animals, and are free from parabans, petroleum-based ingredients, artificial flavors, sweeteners, colors, or formaldehyde-donating preservatives. Whew! That’s a long list but a huge testament in the quality of their products. As a beauty side-note, it is so so nice to find a brand whose makeup is not only flattering & wearable but also committed to the same standard I hold my food to. That’s another post though- today it’s all about dietary supplements. I don’t know about you but I have tried a ton of different protein powders. As someone who works out almost every morning before work, I love the idea of grabbing a shake to take on the road with me or to enjoy at my desk. 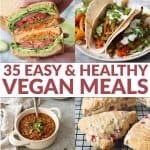 These individual packets or protein in either vanilla or chocolate deliver 20grams of vegan protein + 20 essential vitamins and minerals per serving. I mixed mine with unsweetened vanilla almond milk & handful of kale. While some protein powders leave an awful, chalky feeling in my mouth- both flavors were silky and smooth. The one caveat? I don’t like stevia. I wish I did. I really try to enjoy the sweetener but can’t. I have noticed this with a few other products as well. If you like Stevia, you will LOVE these. They aren’t super sweet, but you can tell they contain Stevia. Looking for a caffeine free energy fix? Try the Energy Fizz sticks! Packed with B vitamins, antioxidants and chromium they add a sweet boost to your water. 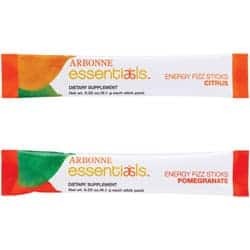 Arbonne Essential Energy Fizz Sticks comes in two flavors, Pomegranate and Citrus. 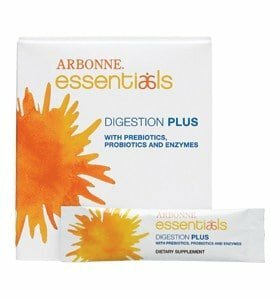 These single-serving sticks contain prebiotics, probiotics, and enzymes that help support optimal digestive help. Those who suffer from IBS, digestive issues, halitosis can benefit from adding probiotics to the diet. Even those without GI problems can support their natural microflora in the gut by adding pro and prebiotics to the diet. If you are looking for supplements, protein powders, skin care, make-up, Arbonne has it! As special DK readers, all new clients will receive 20% of their first orderand can sign up for ongoing discounts! Every order with a retail value of $150 or more will receive a complimentary single product of their choice! Disclaimer: I have received samples from Arbonne but have not received financial compensation for this post. All opinions are my own. I don’t do product reviews often but when I find a company I like, I want to share! I have made a great contact at Arbonne, Karen Cunningham. Please contact her more information or to place orders. Karen is also running a Jumpstart 2013 – Healthy Eating Program. Find out more information on Facebook.